In November 1944, a requirement was issued for a very simple, rapidly produced small fighter aircraft by the RLM. This Miniaturjäger (Miniature Fighter) program was to use the simplest and cheapest power plant available, and to have the minimum of strategic materials and practically no electrical equipment. The motive power chosen was to be the Argus As 014 pulse jet, the same power used for the Fi 103 Buzz Bomb (V1), and the Miniaturjäger was to takeoff and land conventionally. The plan was to be able to build a large numbers of these aircraft, and thus simply overwhelm the enemy bomber formations with their numbers. Only three firms participated in this design competition, Heinkel (with a pulse jet powered He 162 airframe), Blohm & Voss (BV P.213 ) and Junkers. Junkers had been working on the EF126 since early 1944 and it fit the Miniaturjäger requirements issued later that year. It was calculated that the cost of a completed Ju EF126 aircraft would be 30,000 Reich marks, compared to 74,000 for a completed Heinkel He 162 jet fighter or 150,000 Reich marks for a Messerschmitt Me 262. The Junkers Ju EF126 fuselage was of a tapering circular cross-section, and could be constructed of metal or wood depending on the materials at hand. There were two basic designs: a shoulder-mounted wing with twin fins on the ends of the tail planes and a midfuselage-mounted wing with a more standard tail configuration. A single Argus As 109-044 pulse jet engine that developed 500 kg (1102 lbs) of thrust was mounted on the top of the fuselage in both versions. Since a pulse jet must be brought up to its operating speed, takeoff was achieved by the use of two detachable solid-fuel rockets with 1200 kg (2640 lbs) thrust. Originally, a tricycle landing gear system was envisioned, but to save weight and design time takeoff was to be on a droppable takeoff dolly and landing was to take place on a retractable landing skid. A small propeller on the fuselage nose powered the generator until the aircraft was brought up to speed. 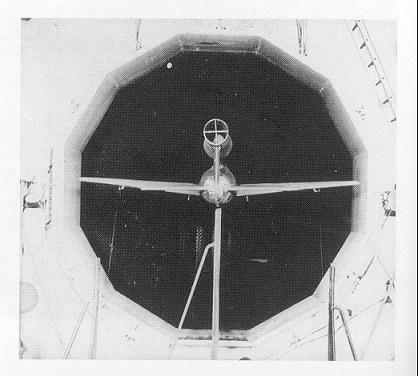 The pilot sat under a bubble canopy located in the fuselage nose that afforded good all around vision. Armament consisted of two MG 151/20 20mm forward firing fixed cannon (with 180 rounds each) mounted on the fuselage sides. In addition, the EF126 could also carry 24 R4M unguided rockets beneath the wings. Since the Argus pulse jet engine's performance worsened with altitude, the EF126 was also to be used in the ground attack role, where an auxiliary load of 400 kg (880 lbs) could be carried beneath the wings. 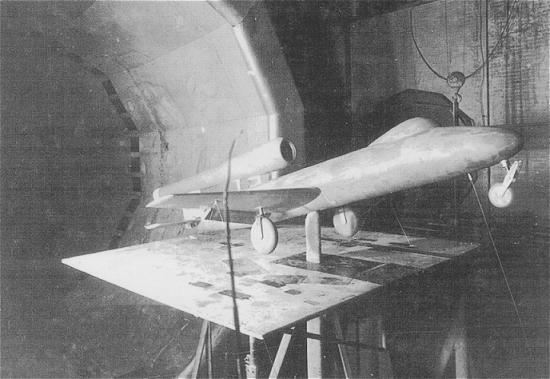 Although a wooden mockup and several windtunnel models were completed at Dessau, the worsening was situation for Germany curtailed the EF126 development and all work was ceased in March 1945. With the end of the war, US and USSR troops arrived at the Junkers plant in Dessau and a complete lineup of Junkers aircraft, including the EF126, was arranged by Junkers design engineer Dipl-Ing. Ernst Ziedel. After the US pulled out at the end of June 1945, the Soviets wanted to get the production of the highly coveted jet aircraft going as soon as possible. Dipl.-Ing. Baade, one of the leading designers of Junkers, presented the Soviet military commission with the manufacturing documents for the Junkers EF126 in September 1945. It was decided to start immediately on the further development of this aircraft, with five prototypes being ordered. The first prototype was to be ready for flight by February 1946, the second was to be built in parallel and to be used as a static test airframe and the third through fifth aircraft were to be completed by April 1946. Due to manufacturing problems with individual components, the V1 - V2 airframes were not ready until May. 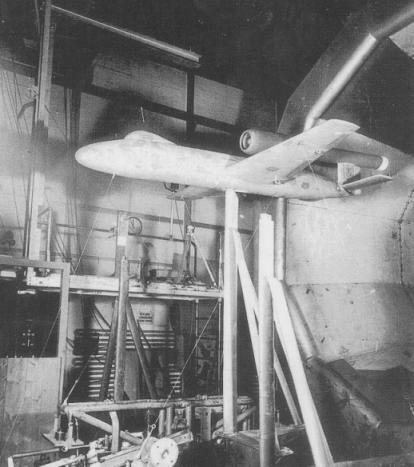 Because the Argus As 044 pulse jet was not ready at the same time, it was decided to test the first prototype (EF126 V1) as an unpowered glider. The first flight took place with Flugkapitän Matthias at the controls of the EF126 V1 and was towed into the air by a captured Junkers Ju 88G-6. The second flight took place on May 21, 1946, but the aircraft crashed and Flugkapitän Matthias was killed. Apparently, the final approach was begun too early, and Flugkapitän Matthias tried to reach the airfield boundary by bringing the nose down to pick up speed. Because the landing speed was too high the aircraft hit the ground violently, bounced 10 meters (33 feet) back into the air, and then overturned several times. The accident investigation revealed, besides pilot error, that the wing profile could also be improved. This was to be taken into account with the building of the EF126 V4. In the meantime, the Junkers test pilot had completed satisfactory unpowered test flights with the 126 V3 in June 1946. The completed V3 - V5 aircraft were accepted by a Soviet commission in August 1946 in Dessau, Germany. A decision was made that all powered flights were to be made within the Soviet Union, so all aircraft and personnel were moved to Ramenskoje in September 1946. Junkers had been developing its own pulse jet engines, and it was now decided to flight test their Jumo 226 pulse jet (500 kg/1100 lbs thrust) on a modified captured Junkers Ju 88G-6. The pulse jet was mounted outside the fuselage on the port side behind the wings and a special Seppler Bemag type fuel pump was driven by a small propeller on the nose. The first twelve Jumo 226 pulse jets had been completed in Germany end of August 1946 and had been sent to Ramenskoje for testing. There they were tested under the management of test engineer Heinrich Hartmann together with the aircraft crew Heinrich Schreiber, Paul Heerling and two other engineers. During the first test flight on December 31, 1946 a very disagreeable low frequency resonance effect was observed, which eventually led to damage of the fuselage structure of the Ju 88 test bed. Some nasty incidents also occurred during later test flights. On Feb. 19, 1947, the fuel line for the Jumo 226, inside the Ju 88 fuselage, broke as a result of excessive vibration. The resulting fuel vapors made an immediate emergency landing at Ramenskoje necessary. After about 50 test flights, a final high altitude test on May 30, 1947 was to confirm the operational capability of the pulse jet at an altitude of 5,000 m (16,404 ft). After a spectacular takeoff, with the help of the Jumo 226, the right-hand Ju 88G-6 engine caught fire. The flight ended with a crash landing that put the aircraft out of action until the autumn of 1947. In the meantime, the first flight of a Ju EF126 under its own power took place. On March 16, 1947, the EF126 V5 flew for 30 minutes in free flight with the pulse jet running and landed without mishap at Ramenskoje. The EF126 V4 was tested from the autumn of 1947 onwards, towed by the rebuilt Ju 88G-6. During these tests, the V4 was released each time shortly before the landing, in order to thoroughly test landing with the skid system. All flights of the EF126 were achieved by being towed into the air by the Ju 88G-6 due to the lack of the planned solid fuel rocket engines. In this manner a total of twelve test flights with and without power were carried out, with the total flight time being logged came to 3 hours 15 minutes. At the end of 1947 the aircraft were parked in the open air which resulted in significant damage to the aircraft caused by the extreme weather conditions. Meanwhile, the German test personnel were taken off the EF126 project in October 1947. Bringing the remaining EF126s back into use in 1948 turned out to be extremely complicated because of the weather damage. The aircraft were moved to the Tjoplyj Stan airfield southeast of Moscow, however no flight test took place here because of the lack of suitable tow aircraft. On the official side, the interest in a small, cheaply produced fighter aircraft had died, since in the meantime the Soviet Union itself had significantly further advanced developments which were already under way. Thus the history of the EF126 ended without any fanfare when all work on the project was stopped in the middle of 1948. Merlin 1/72 Injected, White Metal & Decals includes landing gear! Translated from a German language article in Flugzeug Classic by Helmut Walther. The only known existing photo of the Junkers Ju EF126, taken postwar in the USSR.